Ten-year-old Anna Maria D’Orazi and her mother made a trip to San Giovanni Rotondo in order to attend Padre Pio’s Mass. They planned to stay for several days. During the time of their visit, a number of children were getting ready to make their first Holy Communion. Anna had not made her first Communion yet. It was delayed because her mother had many preparations to make for a party in honor of Anna’s first Holy Communion. The church of Our Lady of Grace looked particularly beautiful on the day that the children were to receive their First Communion. It was decorated with lovely flower bouquets and illuminated with soft candlelight. The girls had on pretty white dresses and the boys were all dressed in suits. Anna had a great desire to join the other children and to receive her first Holy Communion that day from Padre Pio. Anna’s mother did not want her to do so. Being a dress designer, she had been planning to make Anna a beautiful dress for that very important day. She discouraged Anna by saying that there would be no gifts for her, no party, and no beautiful dress. Her mother felt that it would be a great shame for Anna to make her first Holy Communion in her plain green dress, while all of the other girls were dressed up. Anna explained to her mother that she did not care about the party, the gifts, or a beautiful dress. Finally, her mother told her to speak to Padre Pio about it. If he gave his permission, she would go along with it. However, she did not think he would agree to it. With a great joy in her heart, Anna ran back to her mother and told her she had received Padre Pio’s permission. Her mother had no choice then but to relent. She reasoned that she could make up for it at Anna’s confirmation and have the desired party then. Anna told the ladies who were directing the group of children that she had been given permission to make her Communion that day. She moved forward to join the other girls but the ladies rudely pushed her back. The most humiliating incident occurred when Anna was made to stand to the side and then forced to wait until all the boys went ahead of her. She took her place at the end of the line, the very last of all the communicants. Anna’s mother became furious when she saw the way her daughter was being treated. She jumped up and was about to rush up to the sanctuary to get Anna when her friend held her back. She did not want her to make a scene and ruin the day that was so special for Anna. All of the children were then instructed to kneel down at the altar rail. Anna looked up and saw Padre Pio coming toward her. He smiled at her and told her to follow him. He walked up the altar steps to the very top and she followed behind him. He then gave her Holy Communion in front of the tabernacle. She was the only child to receive such a privilege that day. Everyone in the church watched in silence and awe. Some had tears in their eyes. Anna was overwhelmed by his loving gesture and her mother was also deeply moved. Anna and her mother would never forget the graces they received on that very special day. When Gabby Silsby was a child, her family made frequent trips from their home in England to San Giovanni Rotondo to see Padre Pio. Her parents’ devotion to Padre Pio was such that they visited the monastery whenever they could. Once, when Gabby was six years old, she was standing along with many other pilgrims at the altar rail in the monastery church. As Padre Pio passed by, the people at the altar rail kissed his hand. When he passed in front of Gabby, he stretched out his hand to her. Not knowing any better, she took his hand in hers and shook it. When Padre Pio winced with pain, she immediately realized her mistake and felt terrible about what she had done. Padre Pio spoke to her with great kindness and said, “Yes, these are the wounds of Christ.” He then put his hand on her head in a blessing. The moment he touched her, she had the sensation of an enormous weight pressing on her head. It was of such force that it felt like it was pushing her into the ground. A little boy of five years old, Nunzio Fugaccio, from Naples, had found a way to dodge the doorkeeper at the monastery of Our Lady of Grace. Nunzio would then run directly up to Padre Pio who was usually surrounded by visitors. He enjoyed greeting Padre Pio and receiving his blessing. When it was time for everyone to leave, Nunzio would leave too. A priest from Bari, had often noticed the little Nunzio among the group of pilgrims. One evening after everybody had left, and Padre Pio was about to go to his cell, the priest said to the boy, “Nunzio, Padre Pio has candy with him. If you ask him for a piece, he will give it to you.” He thought he was making a good suggestion but Nunzio did not see it that way. He answered very indignantly, “You ask the saints for graces, not for sweets!” Visibly upset, little Nunzio then turned around and left. Amazed, the priest went to Padre Pio and told him what Nunzio had said. Padre Pio enjoyed the story so much that he could not stop laughing. A Note from the editors: Eublio Cardone and Giacomo Piraino recently shared their testimonies with us regarding their experiences with Padre Pio. Giacomo Piraino was born and raised in Brooklyn, New York. In 1958 the Piraino family made a trip to Calabria, Italy to visit relatives. While there, Giacomo, eight years old at the time, became critically ill with typhoid fever. He entered what doctors believed to be an irreversible coma. It was thought that he contracted the illness by eating the cherries from his aunt’s orchard. Giacomo’s family and friends knew about Padre Pio, the priest who bore the wounds of Christ and at this time of crisis, they turned to him for help. Giacomo’s mother, Ida, had written letters to Padre Pio on previous occasions and she had great faith in his prayers. Giacomo remembers from his childhood that Padre Pio’s photographs had always graced their family home. Giacomo recovered from his illness. When he finally awakened after being in a comatose state for two months, he found jubilant family members and friends surrounding his bed, thanking God for the miracle. As Giacomo grew to adulthood, he took a path that lead him further and further away from his faith in God and in the Church. It was a painful period in his life. It was a time of unhappiness. 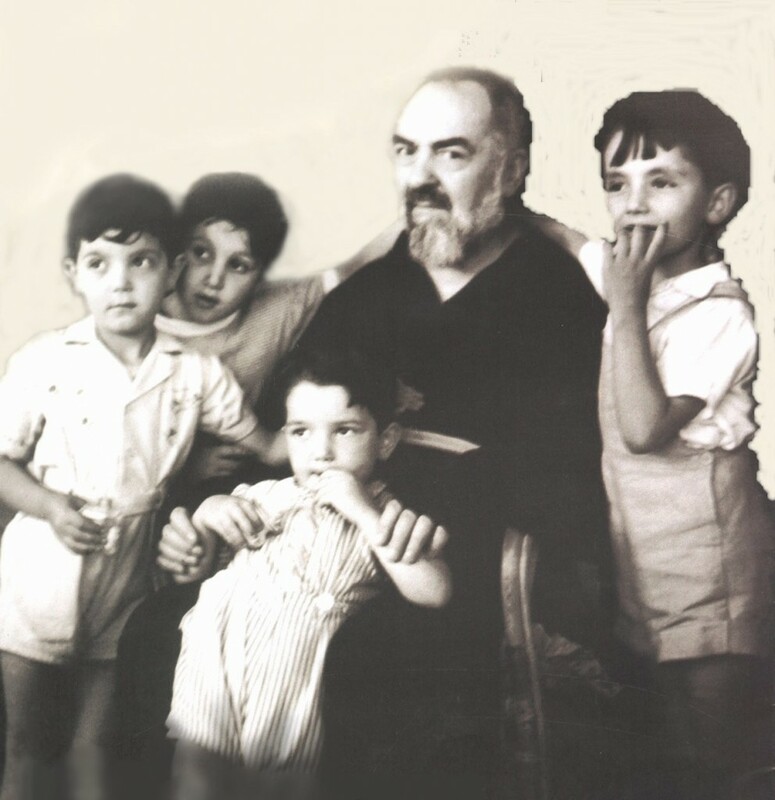 One day as he was reflecting on the many experiences of his life, the words Padre Pio had spoken to his mother so many years before came to his mind, “Your son’s future is dubious. He has four years of darkness ahead.” He did some quick calculations and realized that it had been exactly four years since his life had taken the wrong turn. The reflection proved to be a turning point for him and he began to renew his relationship with God. A vivid dream in which Padre Pio said to him, “Go forward, my son,” gave him great encouragement. These days, Giacomo is keeping very busy with a number of spiritual endeavors. In devotion to Padre Pio, he regularly leads pilgrimages to Padre Pio”s monastery in San Giovanni Rotondo as well as to other Catholic shrines in Europe. His musical talents too, he has dedicated to Padre Pio. His love for his Catholic faith is an increasing love and he has felt Padre Pio’s presence in the many challenges life can bring. “Go forward, my son,” are the words that remain with him today. And that is the direction his life continues to take, thanks to Padre Pio. Eublio Cardone was born in 1921 in Pietrelcina, Italy, Padre Pio”s hometown. Eublio’s parents were close friends with Padre Pio’s parents, Giuseppa and Grazio Forgione, who lived just down the road from the Cardones. Everyone in Pietrelcina either knew Padre Pio or knew of him and everyone held him in the highest esteem. When Eublio’s parents were getting married, Padre Pio’s mother, Giuseppa, gave them as a wedding present, the bed and pillow that had belonged to Padre Pio. By that time, he had moved from the family home and was living at the Capuchin monastery in San Giovanni Rotondo. Because of their great respect for Padre Pio, the Cardones treasured their very special wedding gift. When Eublio was just a boy, he became gravely ill with pneumonia. The doctor could offer no hope to the family. He told Eublio’s mother, Angelina, to buy a coffin and burial clothes, which she did. Noting Eublio’s very high fever, the doctor did not expect him to last through the night. In desperation, Angelina knelt down in front of a picture of Padre Pio that was in her home and prayed, asking Padre Pio to intercede and save the life of her son. Eublio’s condition began to improve dramatically and in a short time he was well. Everyone in Pietrelcina heard about his miraculous recovery. The whole town was overjoyed. Michael Forgione, Padre Pio”s brother, heard about Eublio’s healing and brought him a puppy to keep him company. Eublio, to this day, remembers Michael as well as Padre Pio’s two sisters. Angelina made a promise that someday she would travel to San Giovanni Rotondo and thank Padre Pio in person for the miracle. Some time later she and her son were able to make the trip. When Eublio entered the monastery and walked into the sacristy, he saw Padre Pio for the first time. He realized at once that he was in the presence of a saint. Eublio was seven years old. Padre Pio greeted him warmly and called him by his name. “You are Eublio,” he said. “How are you feeling now?” Eublio was surprised at his words for this was the first time they had met. Angelina and Eublio had a wonderful visit with Padre Pio. They shared memories of Pietrelcina and stories about Padre Pio’s parents and many of their mutual friends. It was an experience that they would never forget. Eublio moved to the United States in his youth and was not able to take Padre Pio’s bed with him. But he was able to take Padre Pio’s pillow. Today Eublio is 84 years old. He has been sleeping on the pillow for more than seventy-five years. Eublio has been keeping very busy lately with a project close to his heart, the Padre Pio shrine, chapel, and monument that are being built in Landisville, New Jersey. Already, many graces have been received by people who have come to the shrine to pray. Eublio has felt Padre Pio’s guidance and protection many times through the years. He will be forever grateful to his spiritual father. Let us empty our hearts and keep far away from us all human prudence. We must try to keep our thoughts pure, our ideas upright and honest, and our intentions holy. We should also endeavor to have a will that seeks nothing but God and his glory. If we make every effort to advance in this beautiful virtue, he who teaches it will enrich us continually with new light and new heavenly favors.